Ein intelligenter, kosteneffizienter Vortex Durchflussmesser mit sehr niedrigem Gewicht. Einsetzbar für Wasserähnliche Flüssigkeiten mit geringer Viskosität. Mit leicht ablesbarem Digitaldisplay, Zähler- sowie Alarmfunktionen. Der LIQUI-VIEW „lite“ besitzt keine lokale Anzeige und verfügt lediglich über einen Impulsausgang. Messberecihe von 4 l/min bis hin zu 133 l/min (~8000 kg/h H2O). 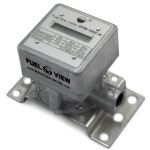 Compact, light weight and cost-effective fuel flow meter for monitoring fuel consumption and operating time of vehicles, tractors, river vessels or any mobile or fixed installations with diesel engines. Protecting and preventing theft of fuel and overstatement of readings. Fuel flows between 1 and 400 litres per hour. 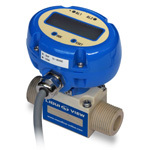 Electromagnetic flow meter for liquids. 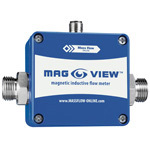 The complete absence of moving parts, it’s interference free operation and the insensitivity with contaminated liquids, makes MAG-VIEW™ the perfect solution even in compact machines with cramped confines. Flow ranges from 1-20 l/min up to 10-200 l/min. 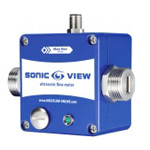 Compact, non-obstructive ultrasonic flow meter for measuring water and aqueous solutions. Very low pressure drop due to straight, stainless steel sensor tube and no moving parts. May be mounted in any position. No straight inlet or outlet runs required. IP54 protected. Flow ranges from 1.5-30 l/min up to 5-110 l/min.